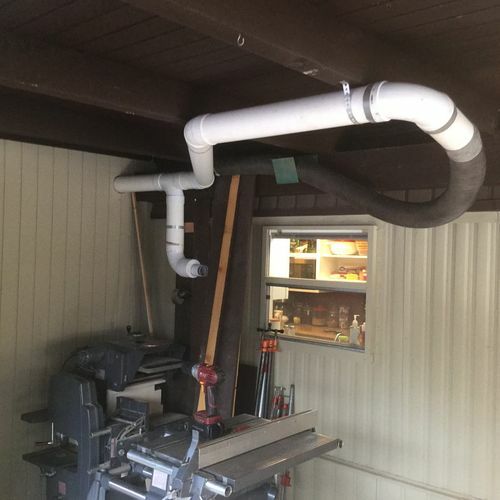 Dust Collection Issues. 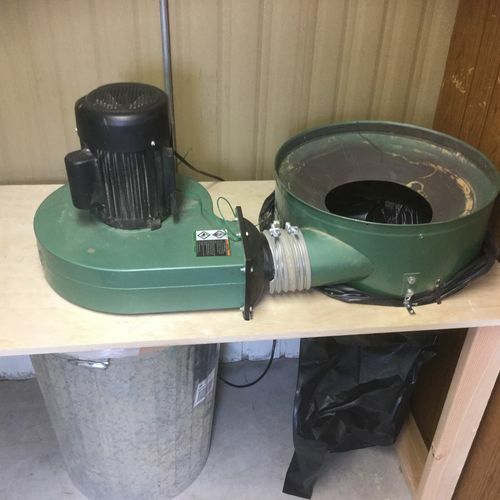 #4: A re-vamp of my Green Valley HF setup with truck filter. I have had my HFDC for several years now, originally stock, then with the Wynn 35A canister, and finally with a couple of home made cyclone type mods. My last mod finally got it built in and piped. Well, we sold that place and bought a smaller one that promises a permanent shop that doesn’t turn back into a garage every night so the DC had to be moved and I can’t do that without tinkering a little more with the system so here is the new setup that I have been using for a couple of days now. 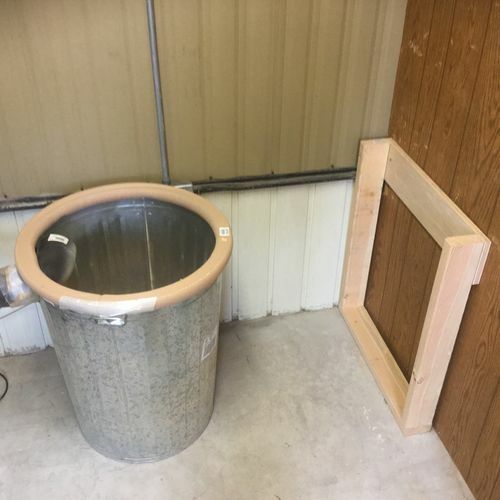 This picture shows the trash can that collects the big stuff. If you look closely you will see it also gets a lot of the fine dust, most in fact. It is attached to my piping with a friction fit between the PVC and the inlet elbow. It is sealed on top with a piece of pipe insulation. It sits a couple of feet from a support frame screwed to the wall. 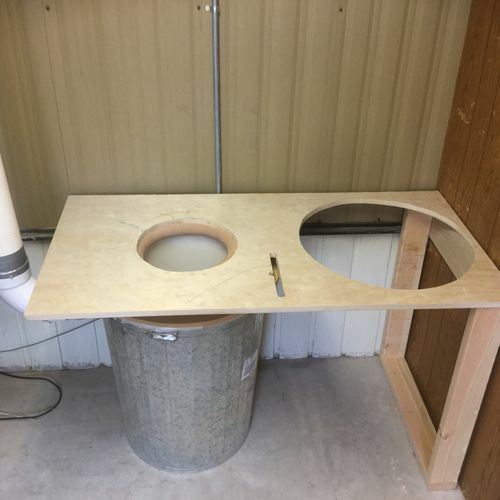 The can is covered with a disc of MDF a with a hole cut to fit a five gallon pail with the bottom removed. 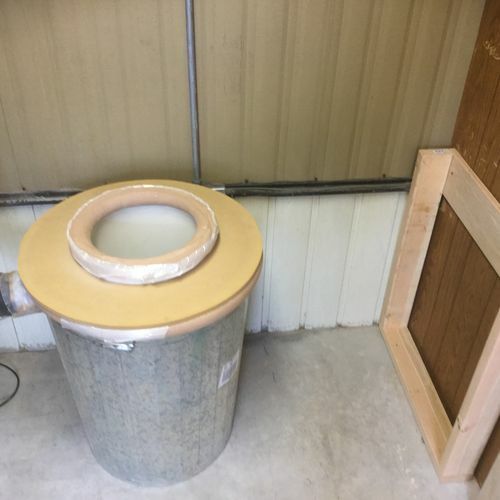 The pail is also sealed with pipe insulation…. ... and seated snugly on its top ring. 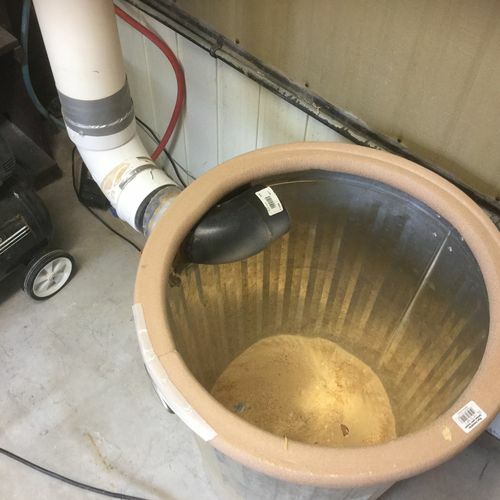 My idea here is that a large volume column of rising air from the bucket will travel at slower speed than a smaller diameter one and carry less dust with it. ..... seems to work. Next is the plywood base that everything else mounts on. 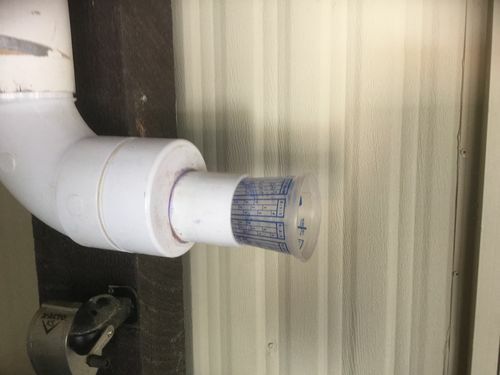 A quick tap on the friction fit PVC pipe and you can lift the trash can end an inch or two and remove the can very easily. Here the motor/fan unit has been placed on top. It is sealed with some self stick weatherstrip. It’s considerable weight makes all the bits below seal very well. A heavy duty trash bag has been fitted in the other hole. Now the diverter ring is in place and the securing strap attached under the plywood to hold the bag. 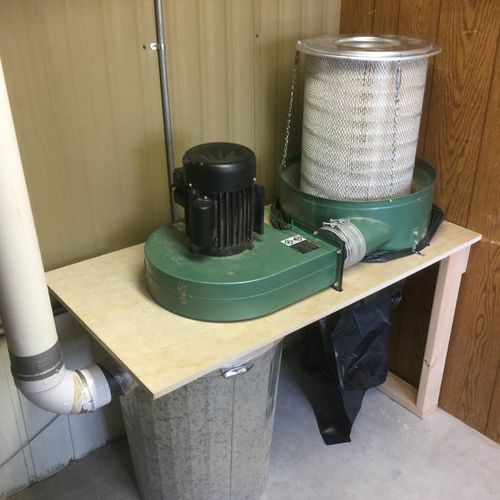 Finally the filter, a Donaldson p181099 is added and secured with light chain and turnbuckles. Again a little weatherstripping seals the joint. Outside the room my minimal piping serves the ShopSmith with a flex hose that reaches all the various places that the SS tools emit dust and shavings. 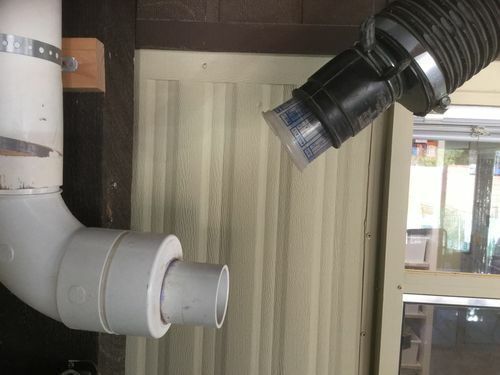 The hose swings up out of the way when not in use. Here she is running with the bag all puffed up. 1) For my purposes this system works wonderfully. I get only a very small amount of fine dust in the bag (which could be much smaller) and I get NO fine dust floating around when I’m using my tools, even MDF dust on the SS tablesaw. 2) The p181099 (99.9% efficient @ merv 15) probably gives me only half of the surface area that the Wynn 35A did but it is many times the area of the original bag and to be honest, I can’t tell the difference from the Wynn. 3) The Donaldson filter can be purchased locally in almost any city and costs under $50 compared to over $175 for the Wynn. 4) If you do want to have the equivalent area of the 35A, the p181038 is under $100 and equally accessible. That’s a wrap I know the subject of HFDC mods has been done to death but maybe some of you can take something from this one. 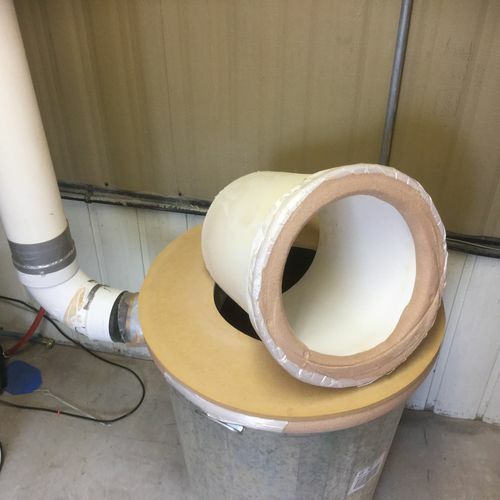 The only thing I may still do is to put a vortex cone in my separator ring to reduce the fine dust making it to the filter but so little does that it isn’t a priority. Nice innovation! Do you have blast gates on the tools? 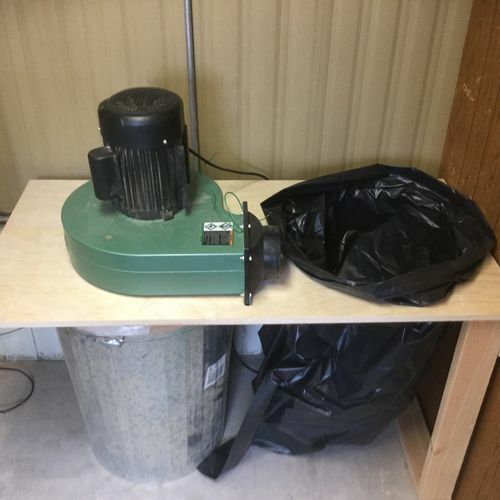 thanks , would this be good enough for a 18’’ drum sander ,getting ready to pipe my shop and am already using the HFDC ? Tom, I will post a pic of my blast gate for you tomorrow. You will love it. 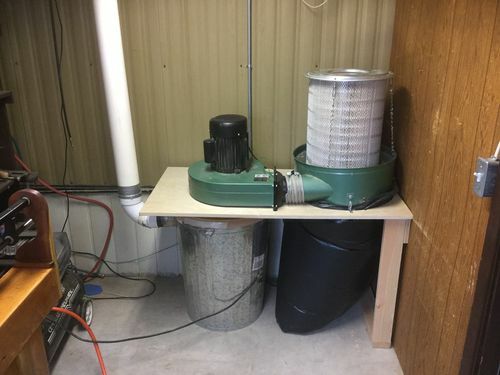 hoss, it’s a standard Harbor Freight 2 Hp motor/fan. Paul is that a Japanese rock garden behind the filters? Most likely I will as you are way ahead of the curve! Good stuff Paul. Thnx for the info on the Donaldson filter. Tom, here are the promised photos of my blast gates. Since I only have two outlets, I only need one. I think these cost around $.50 but small yoghurt containers work just as well and they are free. Efficient and unexpected! Kinda like you? Was that a zen type stone garden in the background of the shots of the filters? I was thinking a representation of water in Arizona? Yes, our new place was very nicely landscaped by a previous owner. It does have an oriental feel but the gravel areas, while nicely arranged, fall somewhat short of what I would call a “Zen Garden”. As always, you work through the most mundane, yet important aspects of the “work” that we do and come up with great solutions. I’ve heard it said that there are more than one ways to skin a cat. Your posts are always well done and bring something to think about in our day to day efforts to “make things”. I wish I had your energy to post the ideas / solutions to problems as you continue to do. 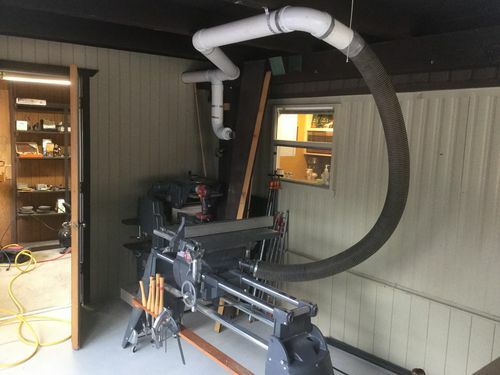 Dust control is a big health concern for all woodworkers. We all need to consider the implications and work toward reducing it. 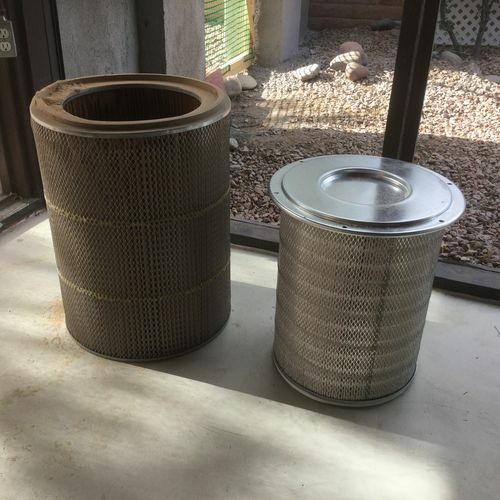 At my local auto parts store, that filter is $85. Where did you find it for under $50? Never mind. I get the idea. Any large truck air filter will do. I see some less expensive options from Amazon. Great setup Paul. I wish I had a setup like that, but I just don’t have the energy to set one up. My new hanging air filter has helped a little though.